Despite a frustrating loss in the opener of their home-and-home series with Ottawa, the Buffalo Sabres aren't ready to give up on the playoffs just yet. The Sabres will be trying to get their postseason push back on track Thursday when they face the Senators at Scotiabank Place. 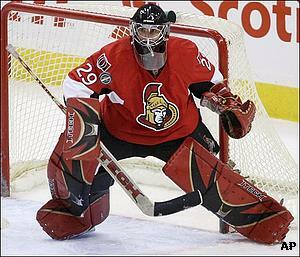 Buffalo (35-30-11) led Ottawa 3-1 with 7:40 left on Tuesday before the Senators (42-28-7) rallied for a 6-3 win. Dean McAmmond scored a short-handed goal to start the five-goal burst, and Anton Volchenkov got the tiebreaking score with just under 2 minutes to go. "It was a good third period for us, and it showed flashes of what you saw last year where we were outskating teams and outworking teams," said McAmmond, who helped lead the Senators to last season's Stanley Cup finals. The rally left the Sabres stunned - and clinging to life in the playoff race. Buffalo is tied with Florida for 10th place in the East, five points behind Boston for the final postseason spot. "We had them where we wanted them," said Jason Pominville, who combined with Derek Roy to score a pair of goals 25 seconds apart early in the third that gave the Sabres a two-goal lead. "It's points that we're letting slip." The Sabres have dropped their last two games, including Friday's 4-1 defeat to Toronto, after winning three in a row by a combined 20-7. Buffalo has six games remaining, including two against the Bruins. Coach Lindy Ruff insists his team still has a good shot at the postseason, citing last season's New York Islanders as proof that it can be done. "The Islanders did it in the shootout with their last shot to get in the playoffs last year and for us, if we take care of business, we've got Boston twice," Ruff said. "If we take care of that without looking ahead, it's still possible." Roy, who also had a second-period goal Tuesday, left with 5 minutes remaining in the third because of a charley horse. He returned for two shifts and said he hopes to play in the finale of the home-and-home set. Roy has four goals and seven assists during a six-game point streak. The Senators, meanwhile, are battling for home-ice advantage in the conference playoffs. They're tied with New Jersey for fourth place in the East and trail Montreal, which leads the Northeast Division and the conference, by five points. Ottawa has five games left, including one against the Canadiens. "We would love to (gain home-ice advantage)," captain Daniel Alfredsson told the Senators' official Web site. "We're going to try. But I think our biggest focus is on how we play. Try to get a little better each game. If we do, I think that will give us some confidence going into the playoffs." Ottawa won for the first time in three games Tuesday and bounced back from Monday's 7-5 loss to the Canadiens. Martin Gerber stopped 29 shots, improving to 4-0-0 with a 2.46 goals-against average in four starts against Buffalo this season. Gerber will make his 13th straight start Thursday and will be trying for his 100th career win.